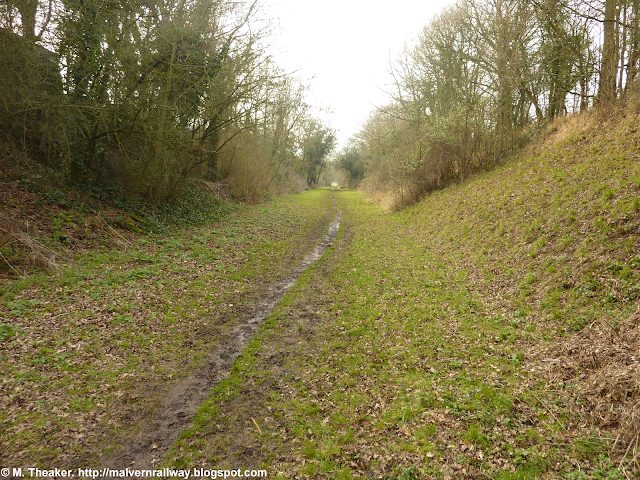 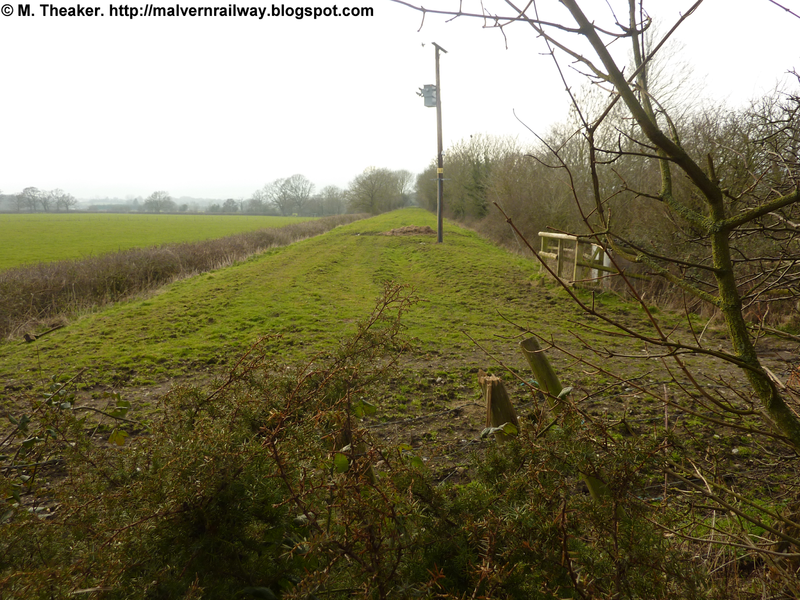 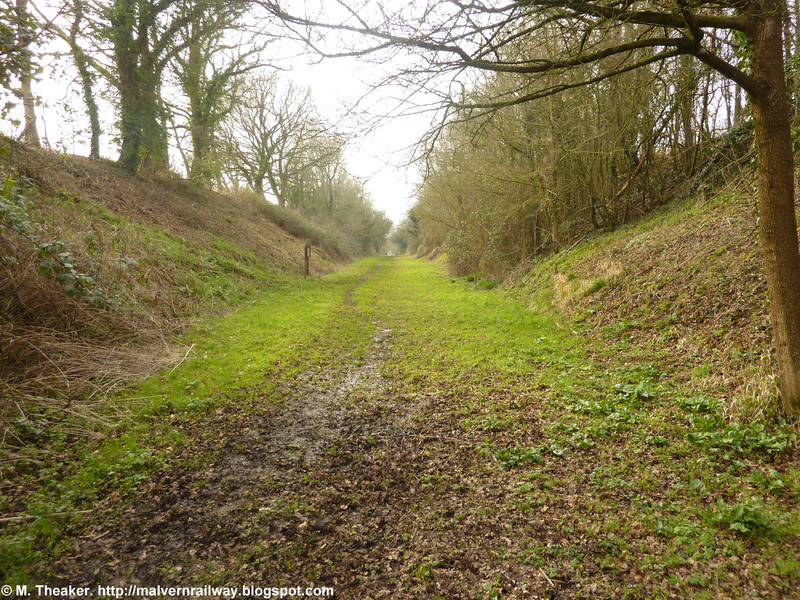 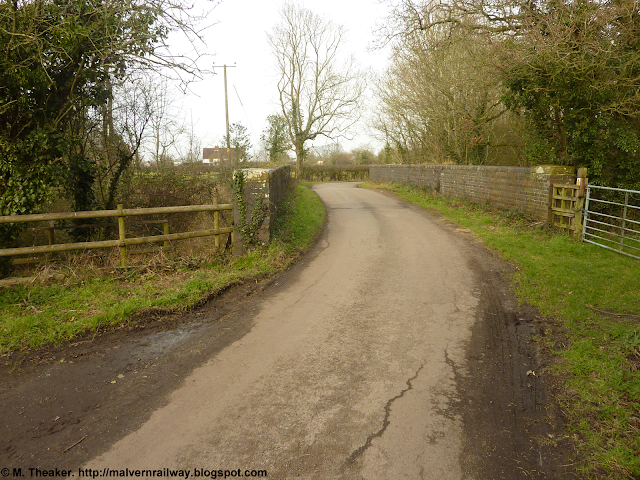 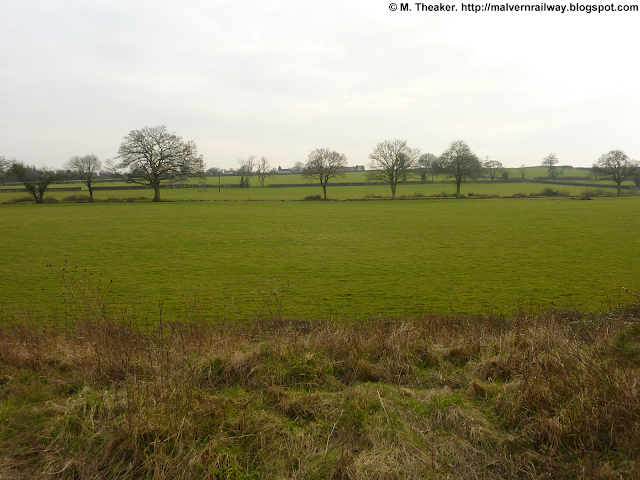 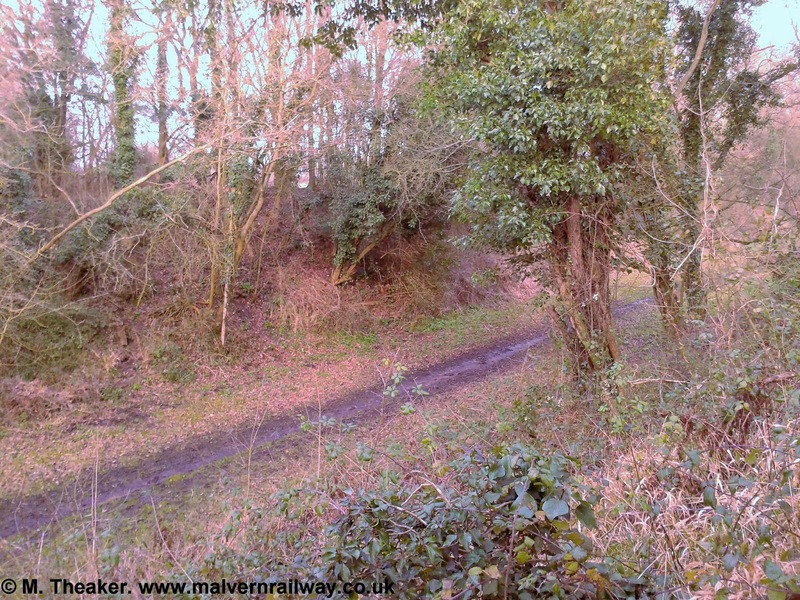 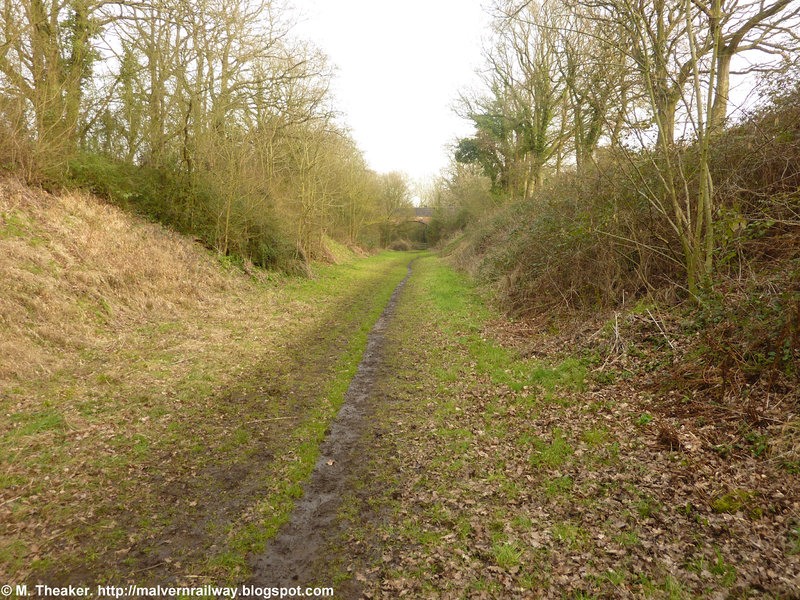 Brotheridge Green is a half-mile stretch of the old Malvern-Ashchurch railway which runs parallel to Gilver's Lane near Hanley Castle. 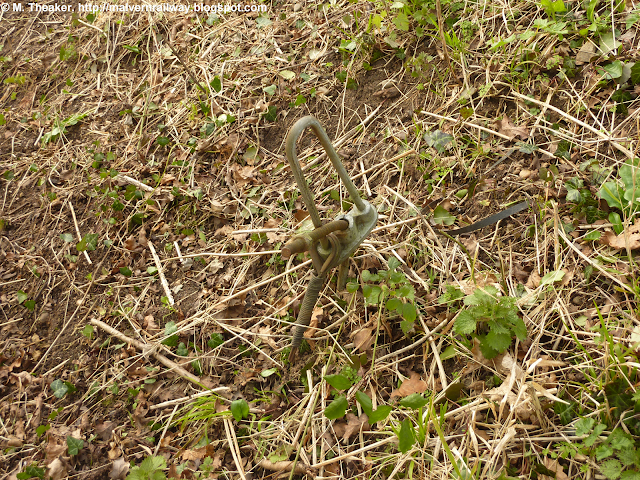 Today, the site is a nature reserve maintained by the Worcestershire Wildlife Trust and is open to all. 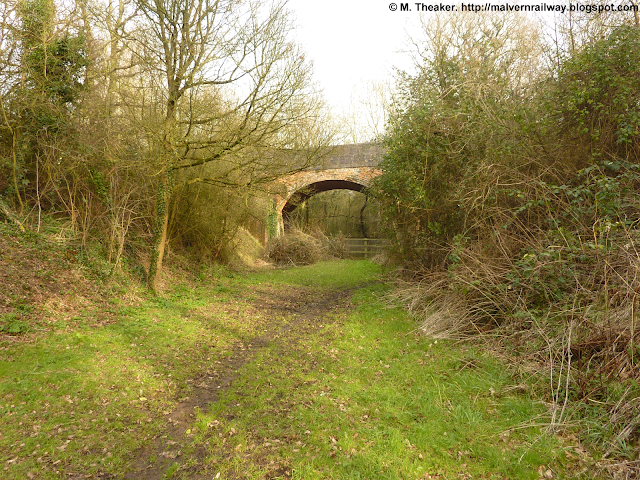 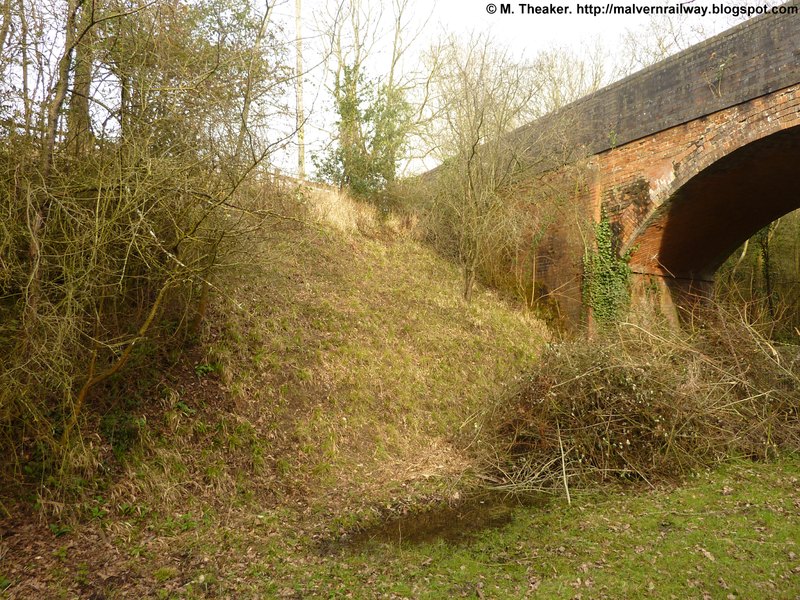 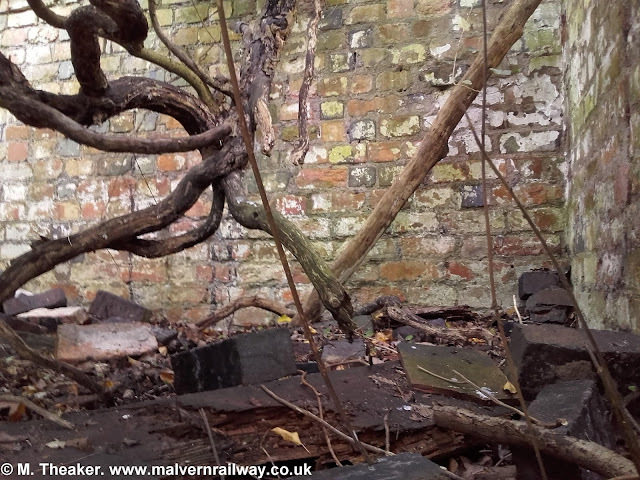 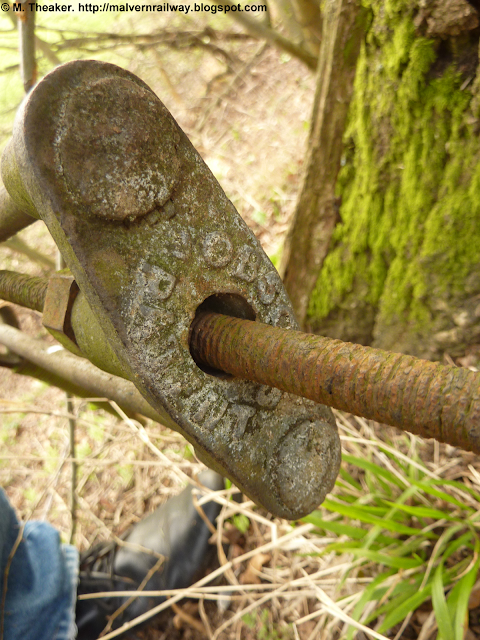 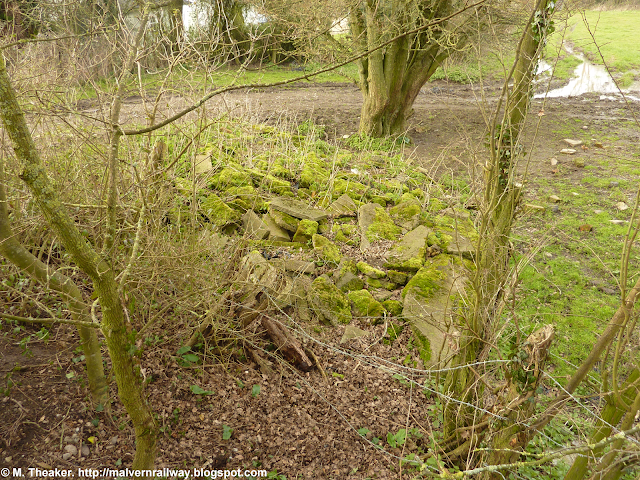 The site retains some original features, notably a beautiful arched bridge, the remains of a lineside shed, and the stumps of a few telegraph poles. The bridge itself is little-used and connects Melrose Farm to two parallel roads nearby. 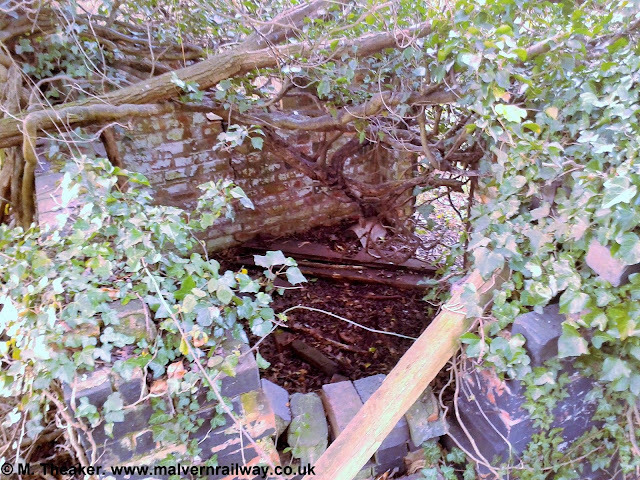 The blue brick used is very similar to other bridges in the area, notably those at Upper Hook Rd and Warren Farm. 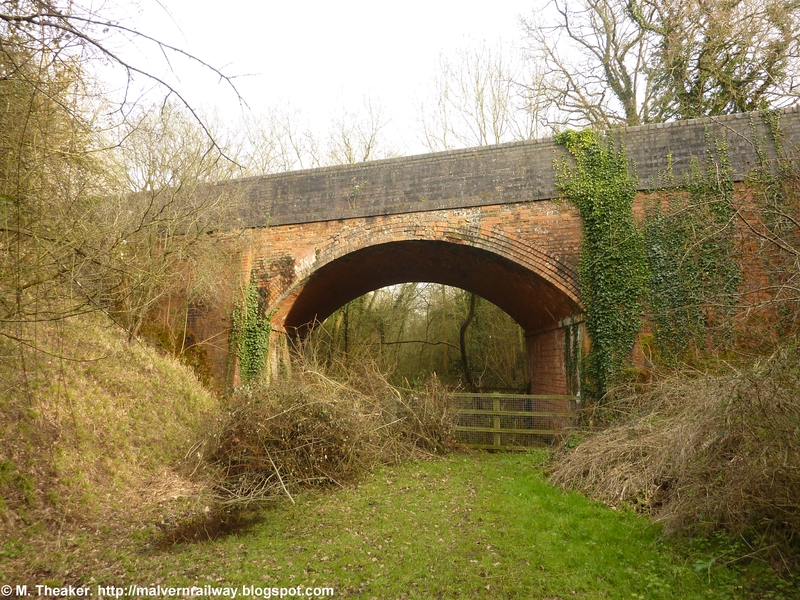 The bridge from the south side. 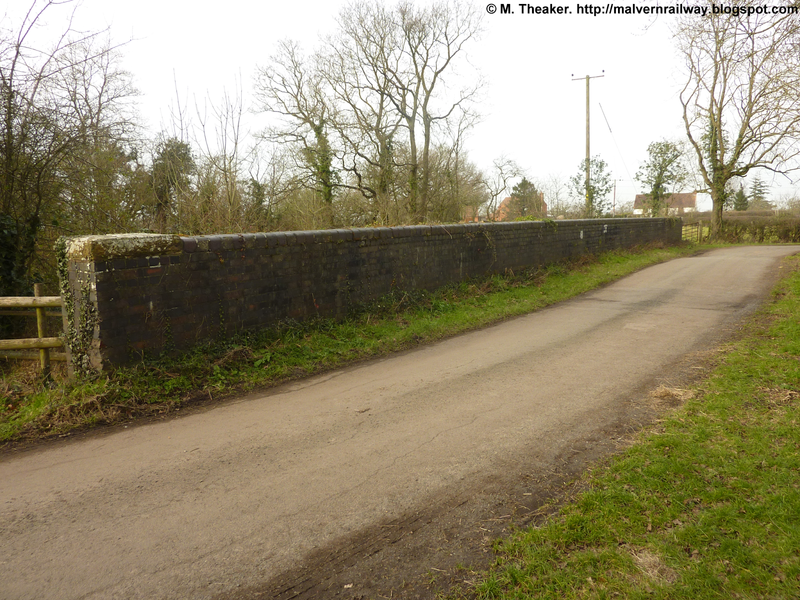 The western side of the bridge. 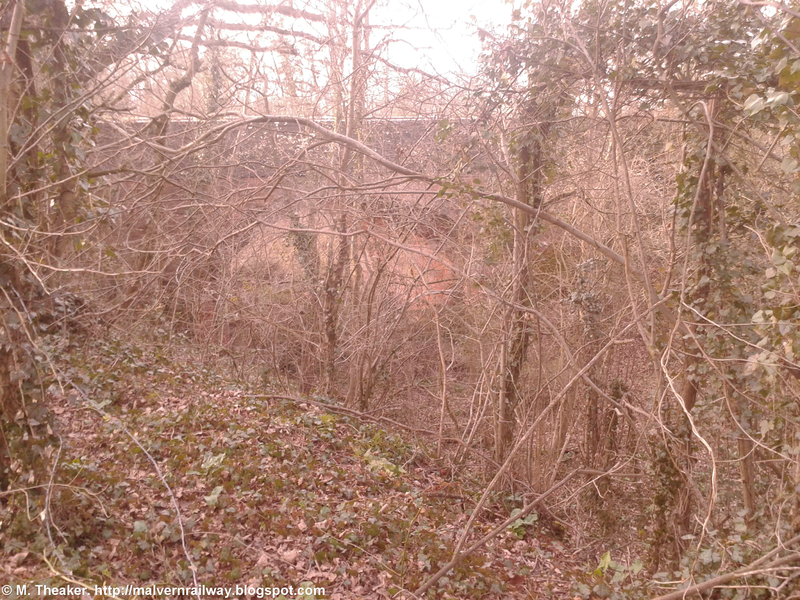 Looking over the bridge, the cutting running across Brotheridge Common is still clear to see, and not much has changed. 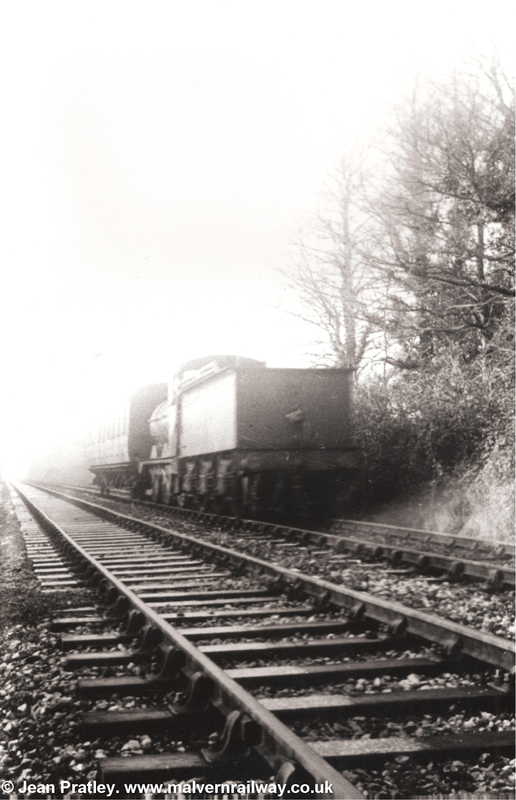 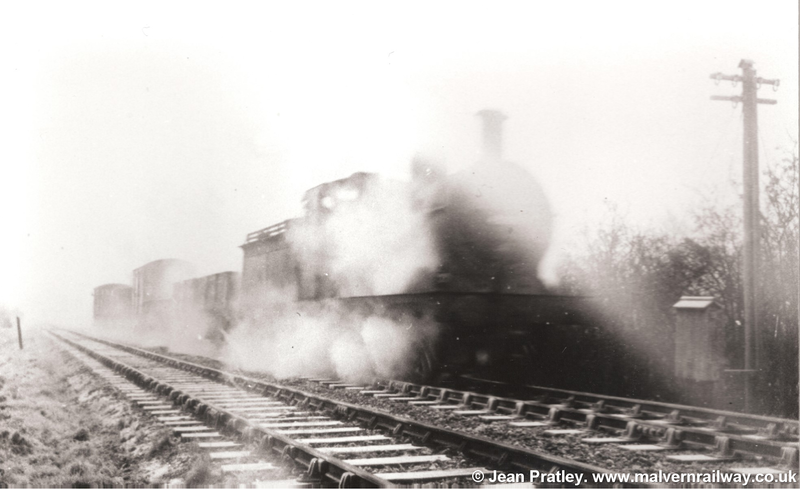 The picture below has kindly been donated by John Mudge, and shows the line still intact two years after it closed. 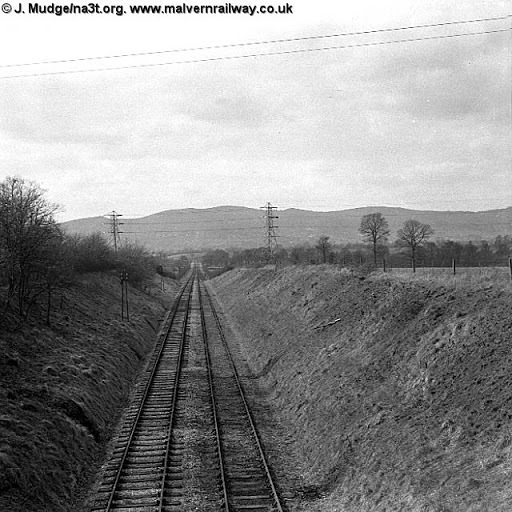 'Tewkesbury and Malvern Railway - Looking towards the Malverns from Brotheridge Common' 27th March, 1954. 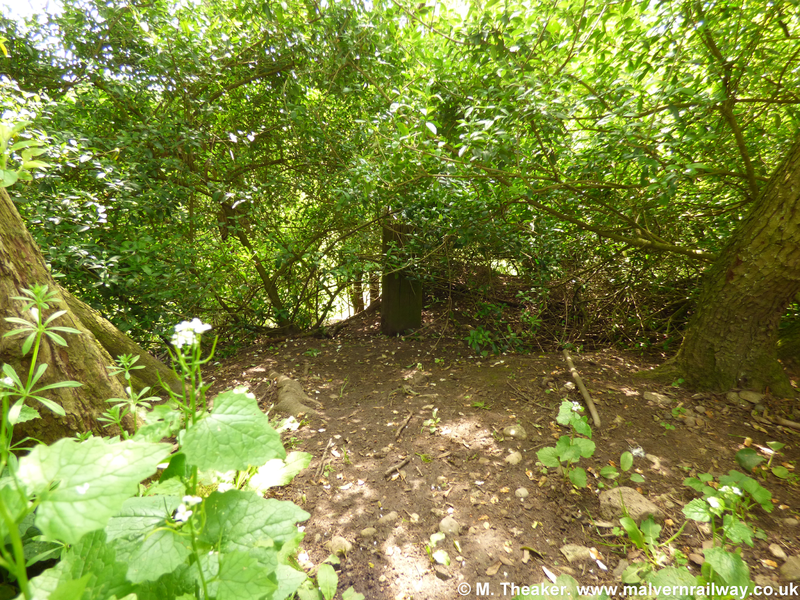 The same view in 2016. 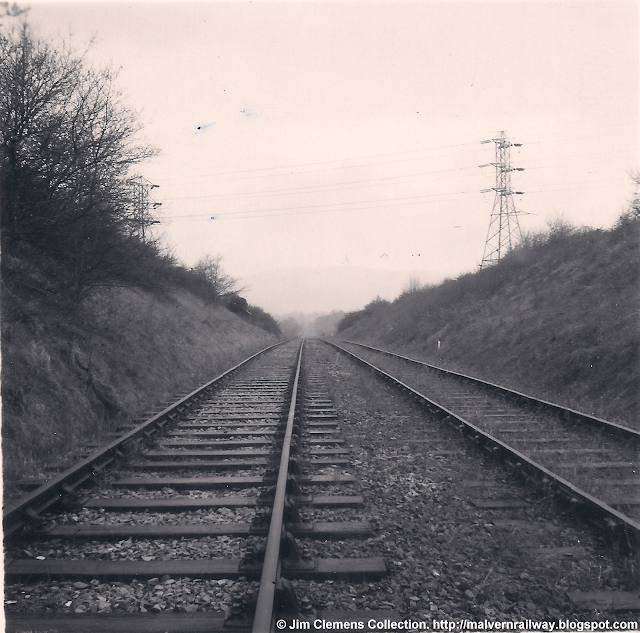 The pylons are still there, but obscured by mist in this shot. 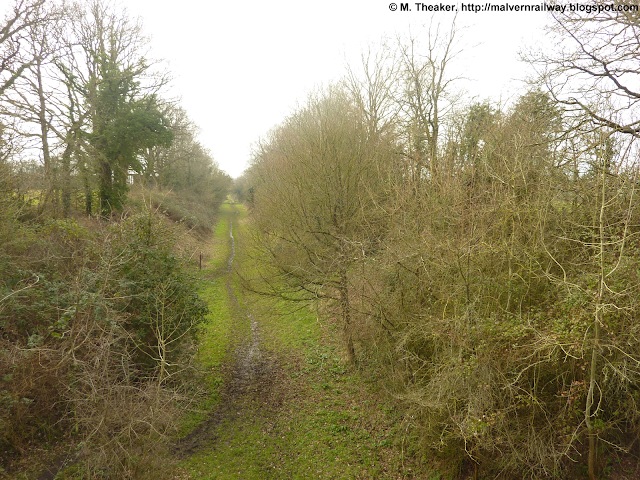 Sadly, the view to the east is not nearly so interesting! The eastern face of the bridge through the jungle. 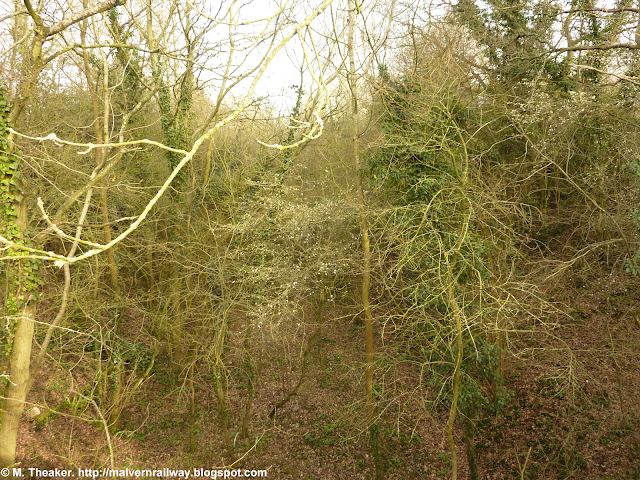 A look down into the eastern cutting, which is private land and not part of the reserve. 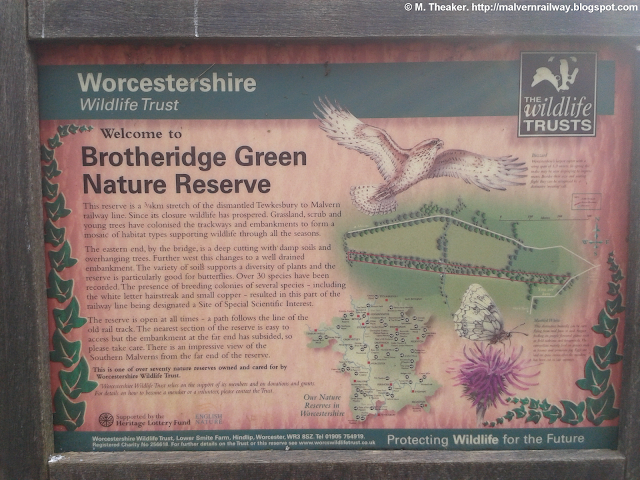 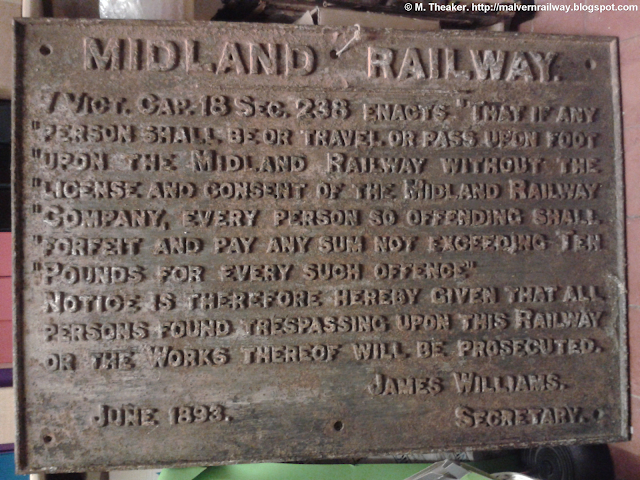 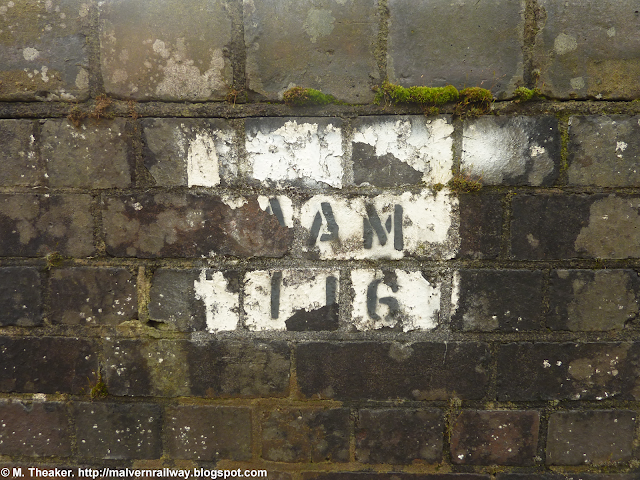 The original sign from the bridge at Brotheridge Green, courtesy of Malvern Museum. 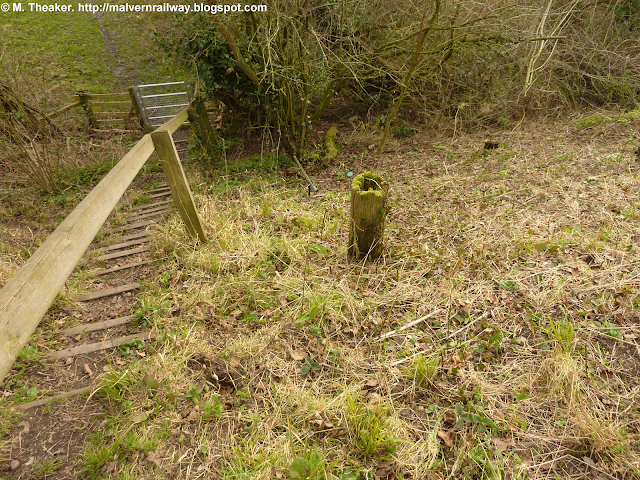 Wandering down the steps into the cutting, the area under the bridge has been fenced off to separate the private land to the east with the nature reserve to the west. 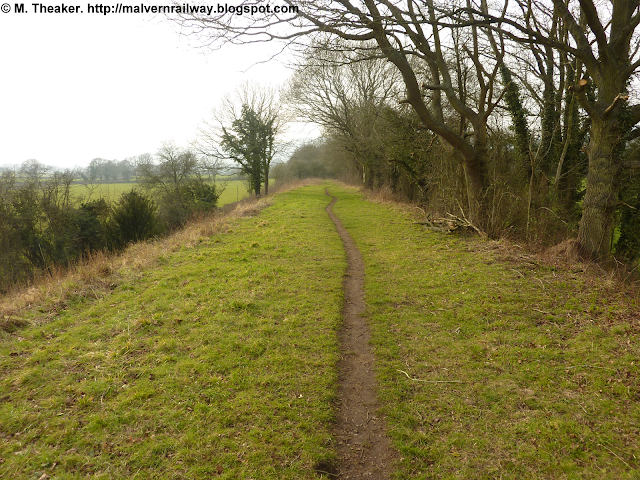 The view towards Upton from the cutting floor. Taking a step back reveals the lovely old brickwork of the bridge more clearly, with a red arch contrasting with the blue roadside wall across the top. An almost identical shot in 2016. 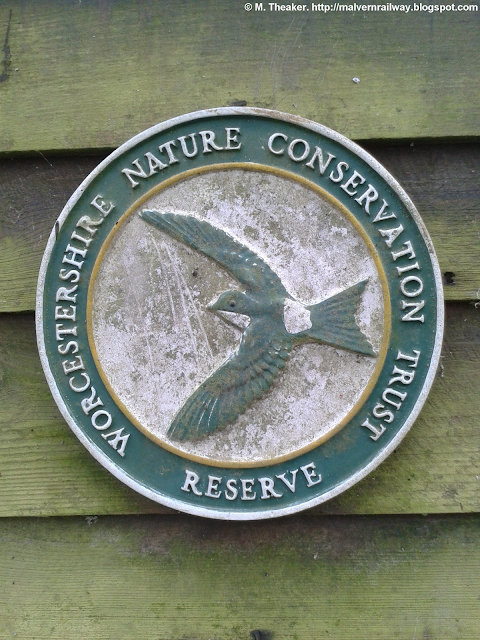 These signs mark the beginning and the end of the reserve. 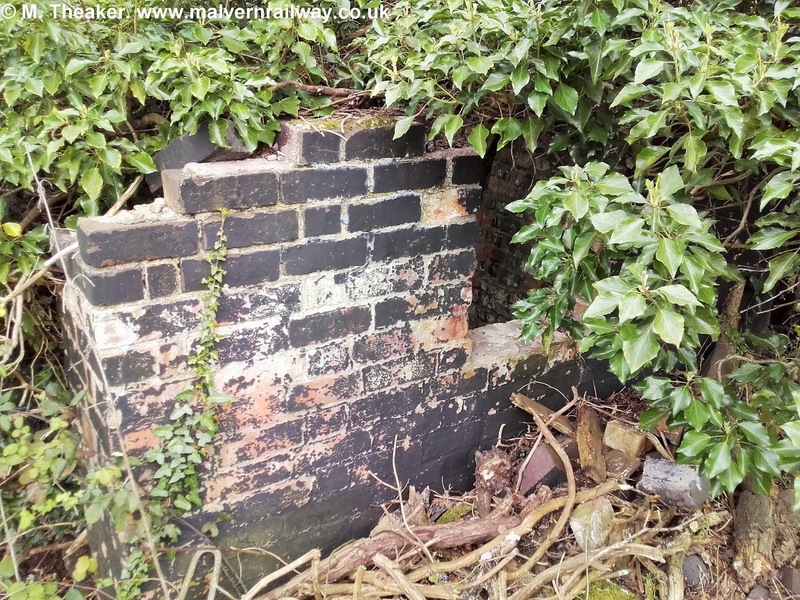 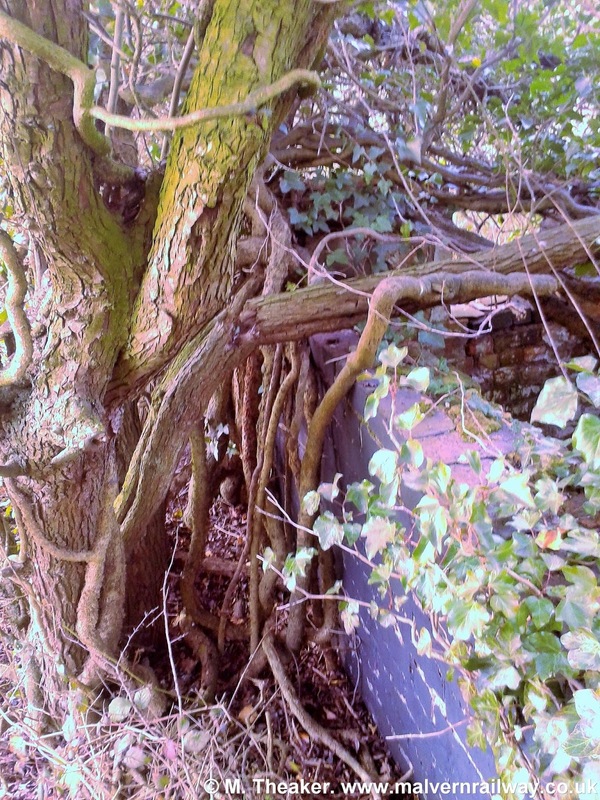 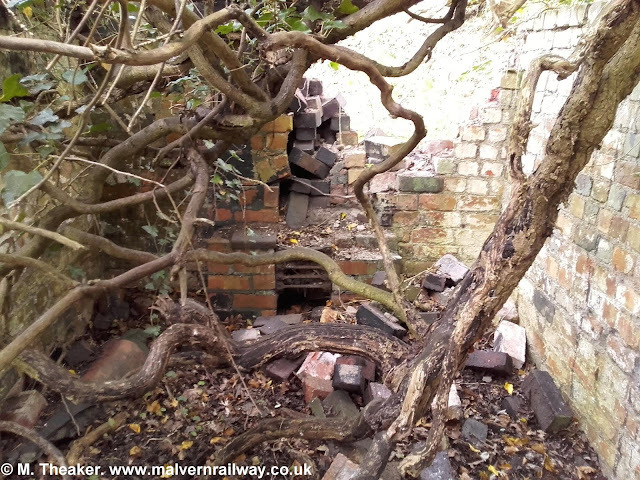 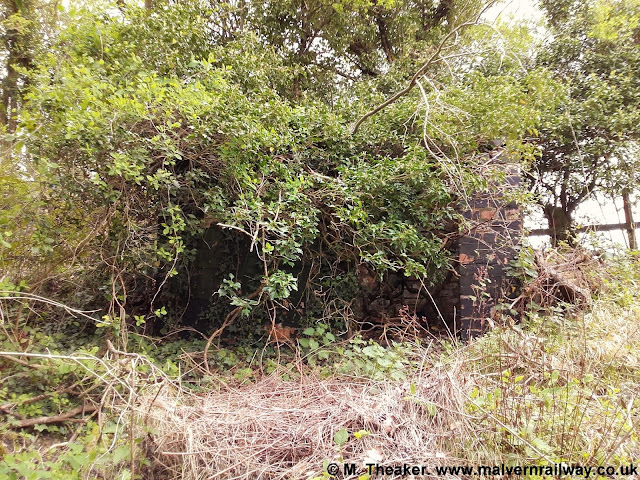 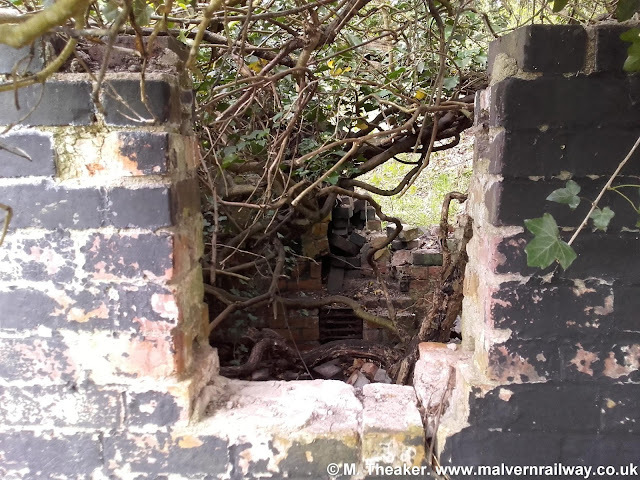 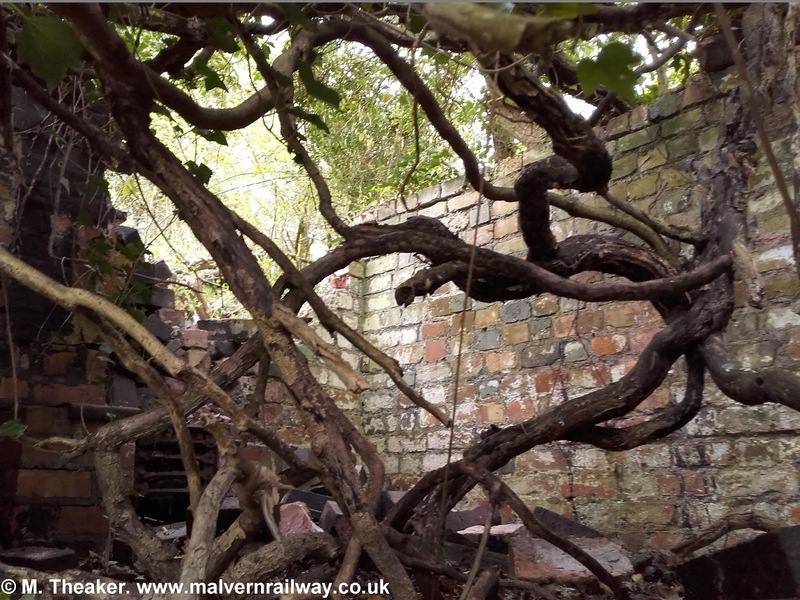 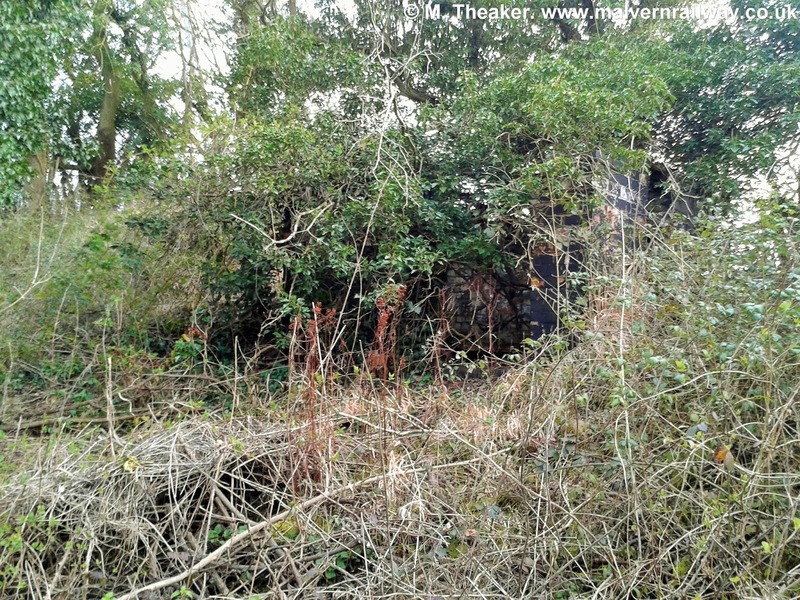 After the bridge itself (which is maintained as it is still in use), perhaps the most interesting relic at Brotheridge Green is this lineside shed, which is in the process of being swallowed by a hedge. 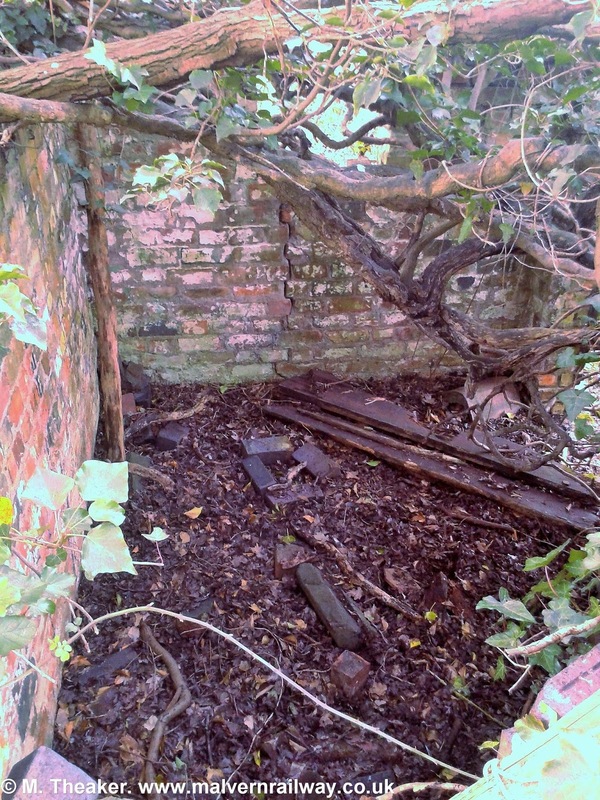 Similar to the shed at Coton Cottage Farm, this building also used to contain a tiny hearth. 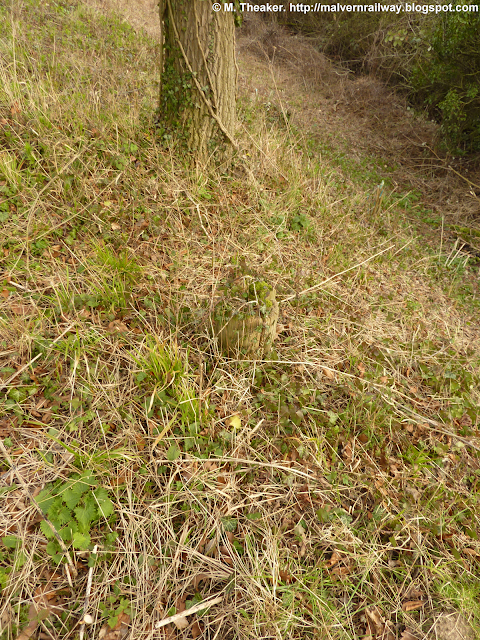 The reverse view, looking east, 2016. 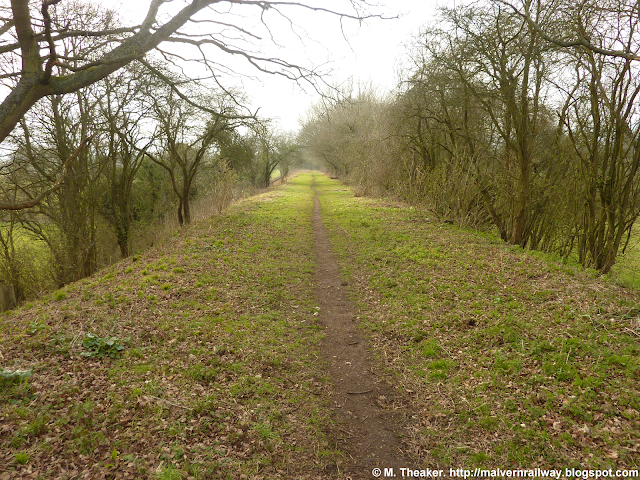 The view westwards from further along the line. 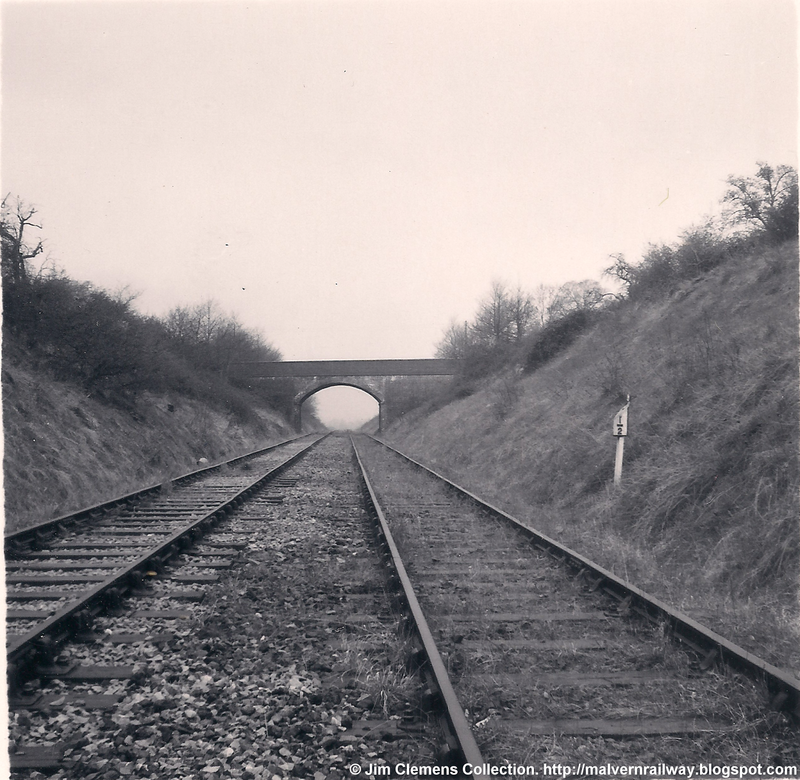 A view of the bridge from further down the line. 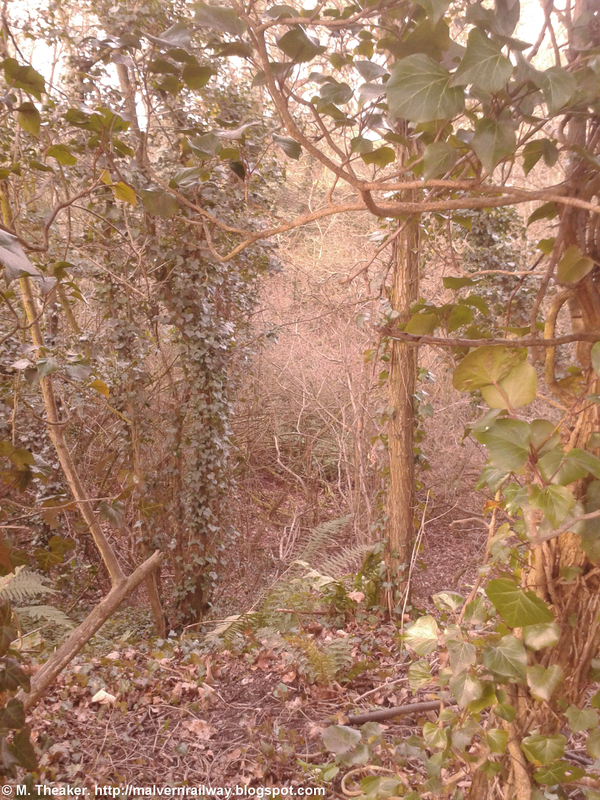 About halfway down this section, the cutting turns into an embankment as we walk towards Malvern. Once the cutting near the bridge turns into an embankment, some stumps of old telegraph posts become visible. I found four in total, each left with about a foot long. 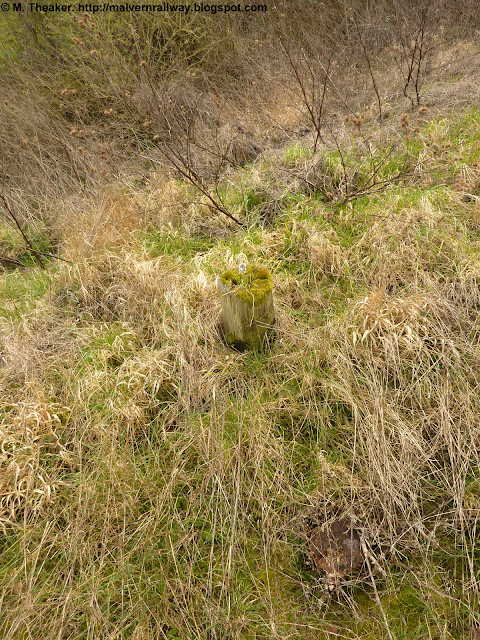 Each stump has an old cable anchor sitting next to it. 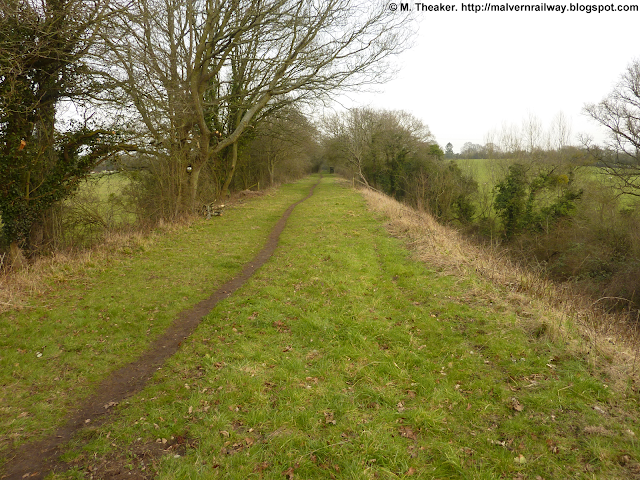 Looking west, 3/4 of the way along the section. 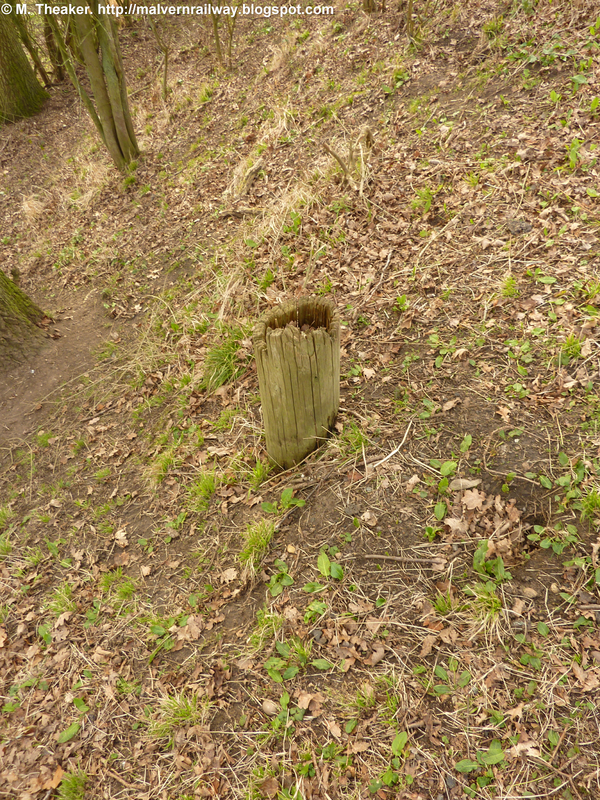 Another stump sits next to some steps marking where a public footpath crosses the reserve. 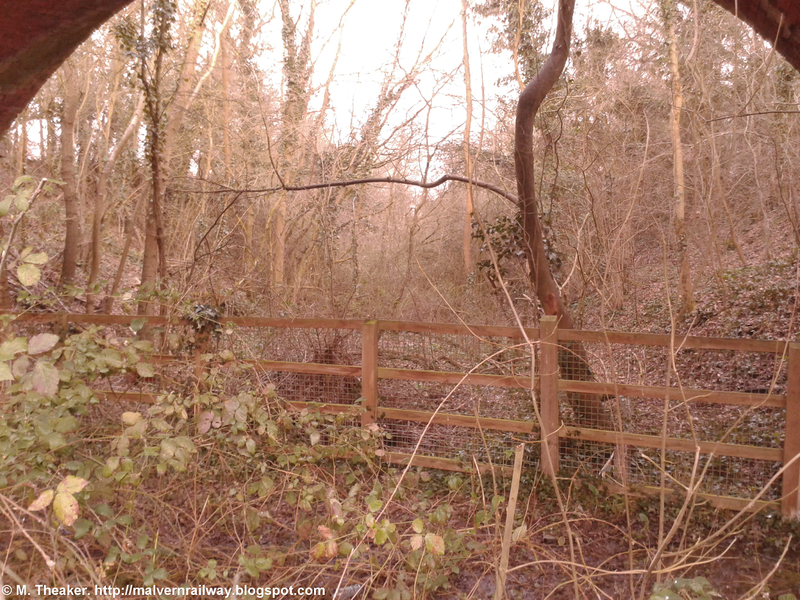 Another look eastwards, with the reserve's birdwatching hide visible in the distance. Stump No. 5 in the undergrowth. 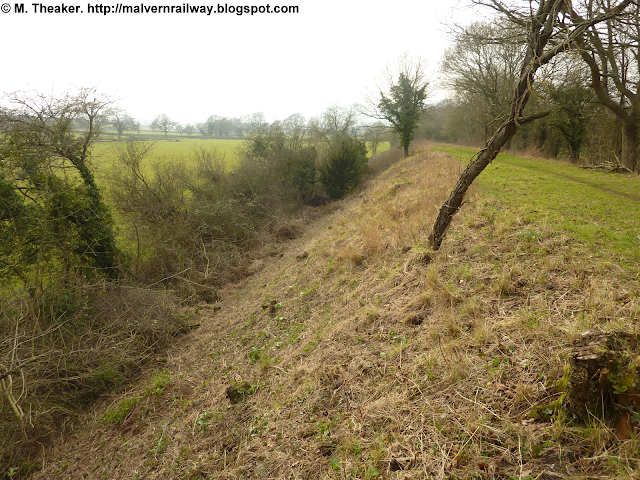 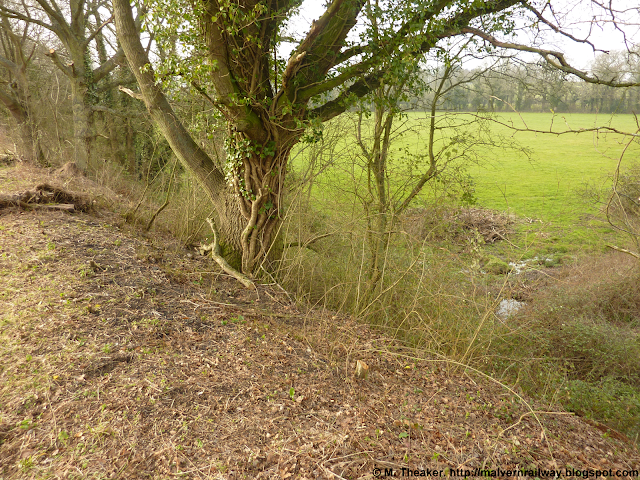 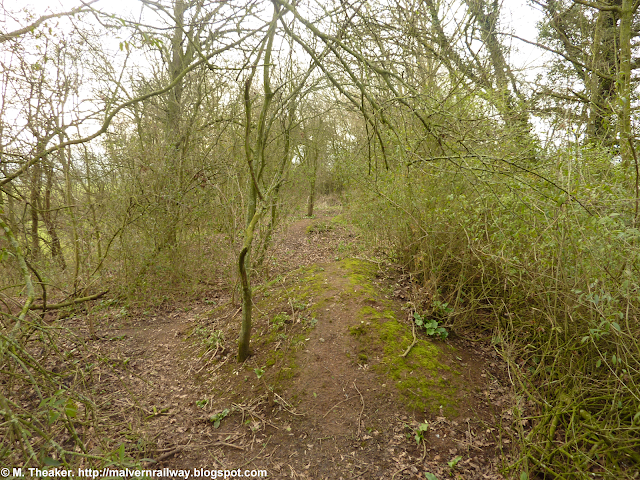 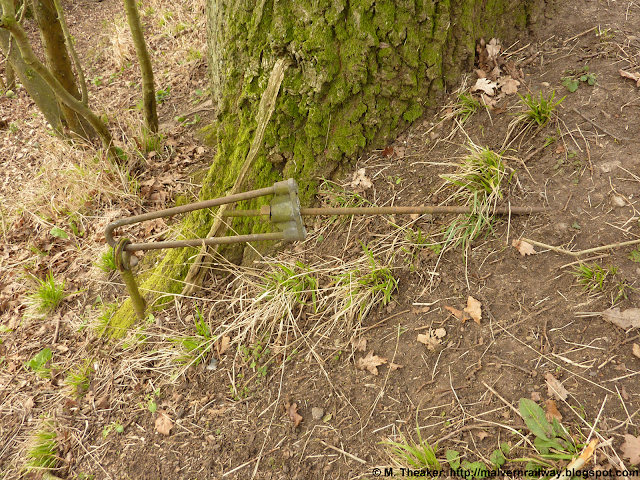 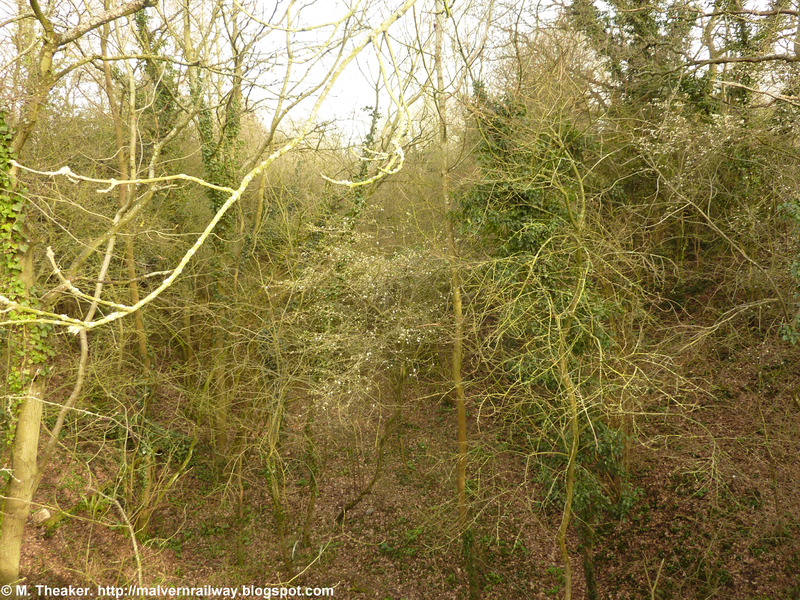 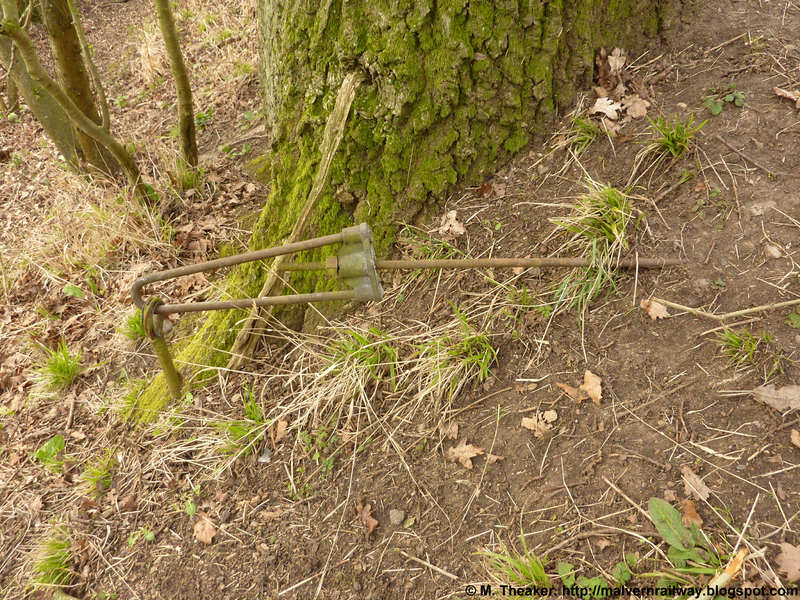 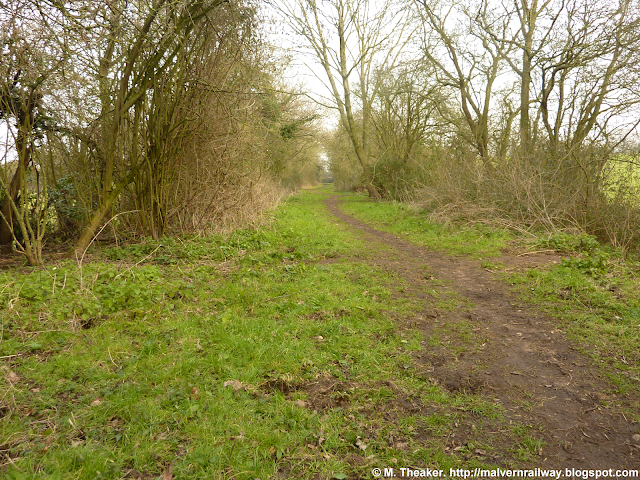 At its western end, the section becomes (deliberately) overgrown and has become a haven for badgers, with large holes pockmarking the embankment. 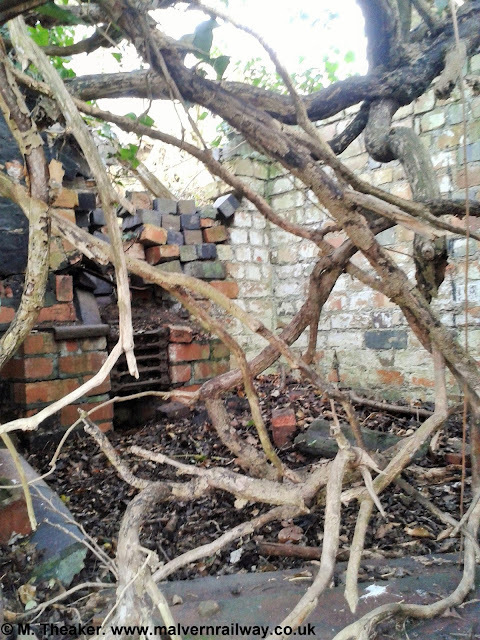 A pile of rubble at the back of The Lodge. The view southwards from the embankment. 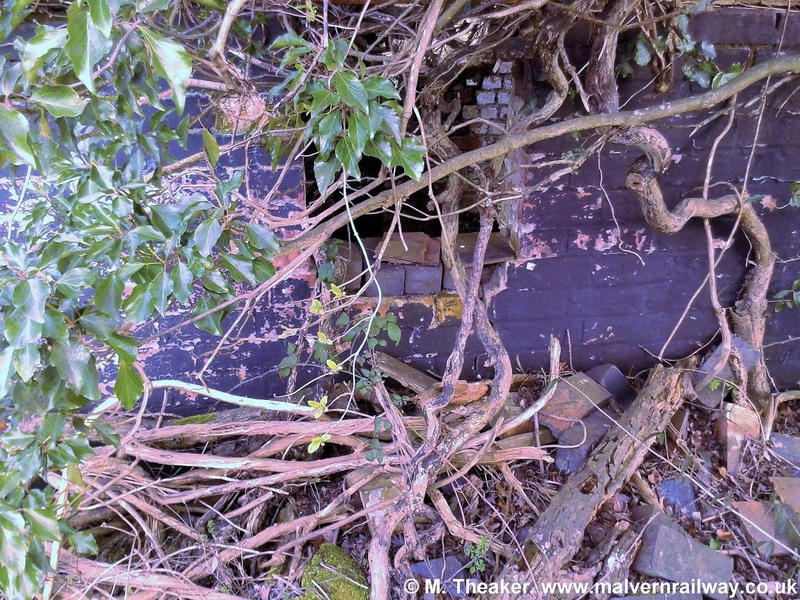 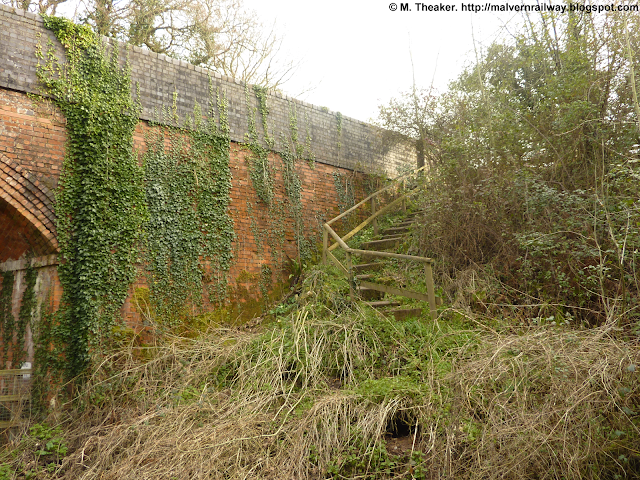 End of the line: Brotheridge Green ends here, whereas the embankment carries on to the demolished bridge on Gilver's Lane.